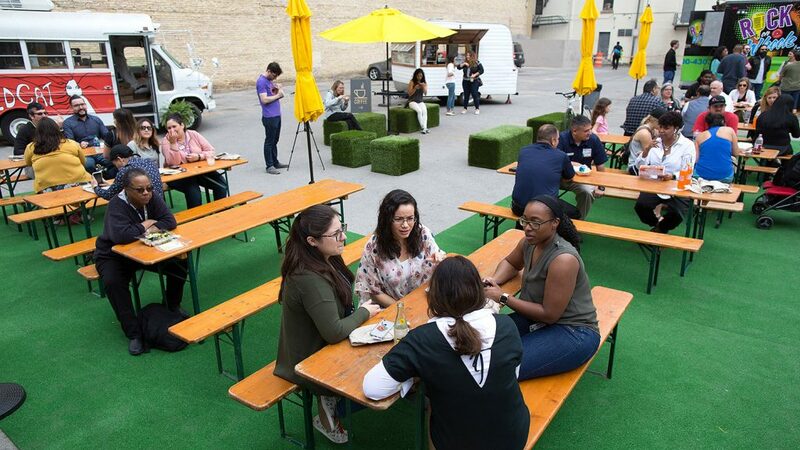 The gathering of food trucks and mobile retail is scheduled for 5:01-8 p.m. Friday at 200 N. Main Ave., in the parking lot across from the Rand building on Houston Street. Admission is free. An all-you-can-eat crawfish boil by Pinch Boil House and Bia Bar will cost you $10. Two bars will offer $5-$6 wine and bubbly options from Rosella at the Rand, $6 beer from Dorćol Distilling + Brewing Co. Free mini Topo Chico. Sound Cream Airstream will dispense jams. The 5:01 p.m. start time is deliberate, and the message is a simple one from Centro to downtown workers. The series, which began in March 2018, usually is held during lunchtime in the parking lot at Jefferson and East Houston streets. This is the first time it’s being held closer to west downtown, across from start-up incubator Geekdom, which occupies four floors at the Rand. The Spot on Houston is intended to show workers and residents the untapped potential of Houston Street and the rest of downtown. While Houston Street is typically vibrant during the day with office workers, and on many weekends, it still remains comatose most week nights.